Getting a manicure is all about looking good and feeling pampered. Upgrading your manicure table can provide the papering and comfort your clients turn to you for. Select a style that complements the look of your salon at Source One Beauty. 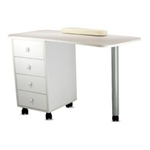 We offer nail tables in different styles and nail stations that fit every need. Professional manicure tables are available with cushion pads for your clients comfort, lamps for extra lighting and quick dry options, side storage drawers, and nail polish display stands. Also look for manicure tables with ventilation fans. 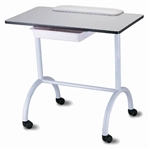 If space is an issue in your salon or if you are a traveling manicurist then consider our portable manicure tables and nail tables with casters option. The right product is available for your manicure needs at Source One Beauty.